Just other day we were discussion the upcoming St. Patrick's Day Feast, and I was thinking about finding some Irish Red Ales to enjoy. 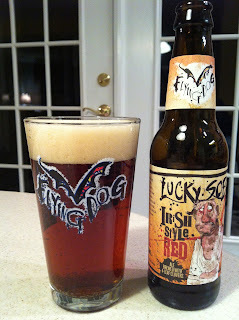 Not long after that conversation I arrived home to find a sample of Flying Dog Lucky S.O.B. Irish Red Ale sent by the brewery. I enjoy this malty style on occasion and was looking forward to trying out the Flying Dog version. 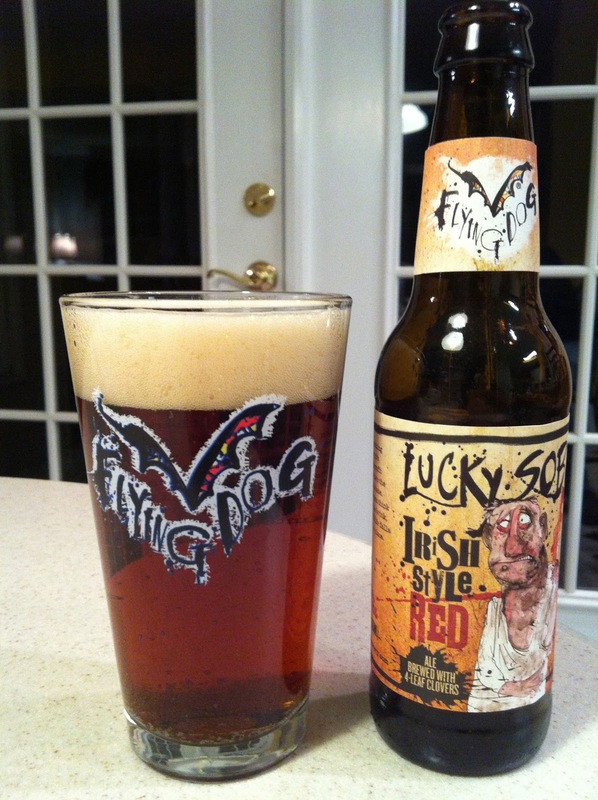 Poured into my Flying Dog glass, the beer is a clear, reddish-copper color with a frothy off-white head. The aroma of bready malt and caramel is quite strong. The flavor is rich in toasted malt with a very faint sweetness. The finish brings on a lingering bitterness which remains along with the toasted malt flavor. The flavor profile is simple, but what is expected for the style. It's a clean, smooth beer and at just 5.5% ABV I could have easily enjoyed another. Flying Dog says they brew Lucky S.O.B. with "real four-leaf clovers" so I guess it's a natural for toasting our favorite Irish Saint, St. Patrick, next month. The brew has previously been distributed only on draft and is released in bottles for the first time this year. It should be showing up on the store shelves through March. I'll be looking for it. Disclaimer: This bottle of Flying Dog beer was an unsolicited gift from the brewery. This review written of my own free will.